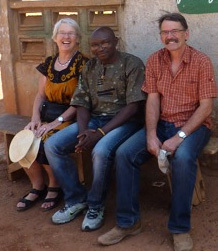 Thus it was a shock to all to learn that Dorothe passed away unexpectedly, just weeks after she and Christian returned to Switzerland from Ghana. Dorothe had a large, open heart, and wonderfully embracing personality, that deeply touched and infected all who had the good privilege to know her. In her memory, friends and family donated over $18,000 to PAMBE Ghana to start an endowment fund. It is with profound gratefulness that PAMBE Ghana announces that the Dorothe Schneebeli Fund has now been established through a board-designated fund with Fidelity Investments.